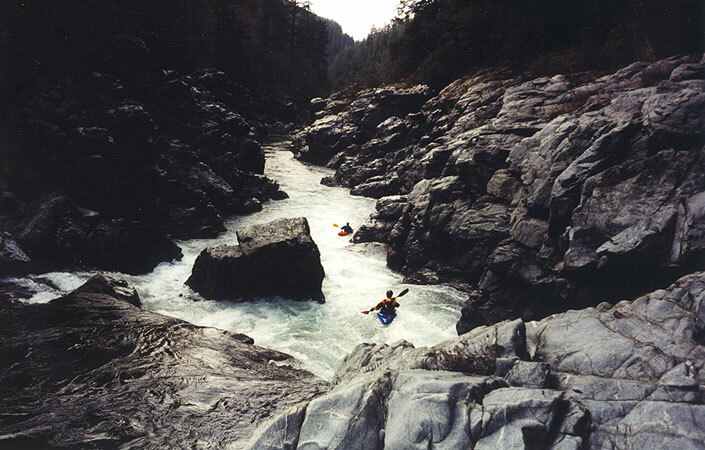 The lower South Fork Gorge on Northern California's Smith River is an excellent run which only has one drawback: It's too short! 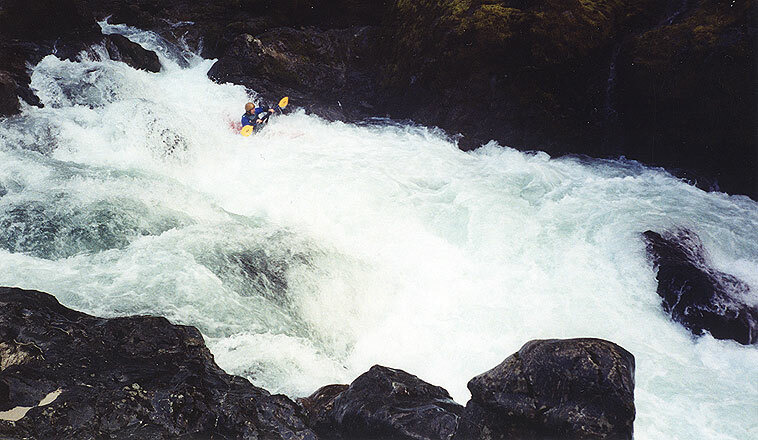 This gorge is about a mile long and packs a wallop at any flow, with great rapids and stunning scenery.. you won't be disappointed by this one! Pete's boat contrasts nicely with the crystalline green water of the South Fork. 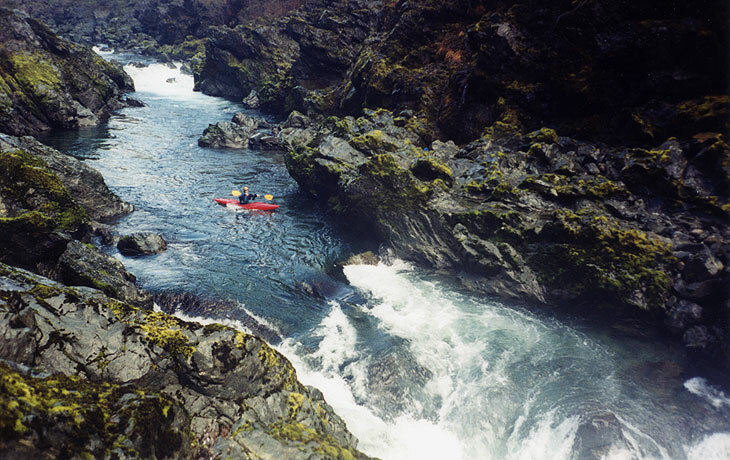 The South Fork and Oregon Hole gorges have the same take out, so we did Oregon Hole first and then the South Fork. After our carnage in the Oregon Hole the size of the group dropped from eleven to four as the South Fork is generally considered to be a more difficult run. We found that there are definitely more big drops on the South Fork, and that they have much bigger holes! 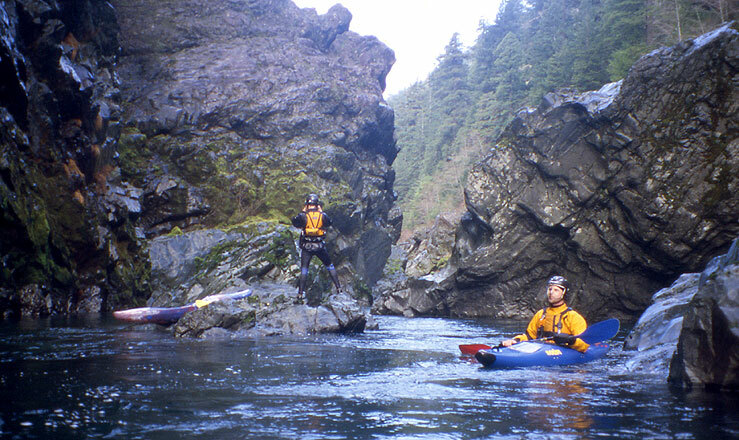 Generally, we thought that in Oregon Hole Gorge you more or less run everything right down the middle, while in the South Fork Gorge much more maneuvering is required to keep from getting munched in some of those holes! Steve, Pete, John and I put on and quickly reached the gorge a half mile below the put in. I was instantly enthralled by the fantastic-looking rock walls of the gorge... Words cannot do this place justice! Entering the South Fork Gorge..
After a couple of smaller rapids we were out of our boats scouting the first big horizon line. This first drop consisted of a broken up ledge with a hole that was bad on the left and worse on the right. I scrambled up high on the rock wall and thought I saw a tongue of current going through the far right side of the huge hole on the right. Without taking a closer look I headed back to my boat and as I passed John I said "I think I'm going to run far right through the hole." John grimaced and said calmly: "I've never called you on it but I'm going to now- if you run that side you're gonna swim!" That stopped me cold. "Like I said," John repeated. "I've never second-guessed you on any line you've picked but you're not coming out of that hole." I climbed over to where he was sitting and saw that he was right- from his perspective (a much closer, low angle view) the hole looked positively horrible. "Man!" I muttered. "You're right." Needless to say I selected their preferred line, a left boof which narrowly avoided the aforementioned chomping hole that dominated the right side of the river.. I went first and had no problems, followed by Pete, Steve, and John. The Author shoots some photos of the gorge while Steve relaxes in the pool. Downstream there were three or four similar drops- here john lines up on another one..
More rapids followed, separated by large pools. At one point the river round a slow, deep green pathway through incredibly jagged and twisted rock walls that we were like nothing I have ever seen. What a wonderful place! Pete careens through last drop in the gorge while Steve looks on from an eddy. After we were done John did a very fast solo re-run of the gorge (in about 10 minutes flat) as he wanted another go at it... I was still changing at the parking area when he came jogging up, already having sprinted through the gorge again, wondering where the car was! Flows: We ran this section when the Pat Welchs gauge Smith River at Crescent City was at 1500 cfs. 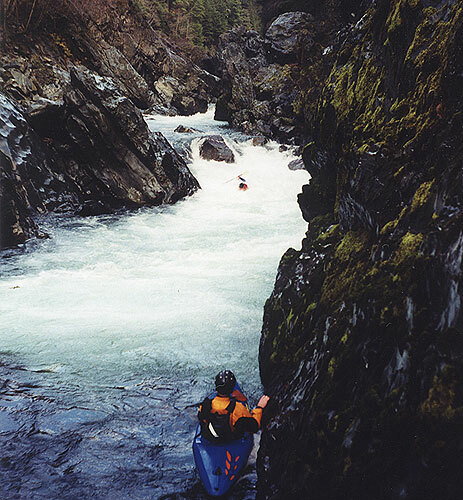 This translated into about 700 cfs in the South Fork Gorge. We were on the last day of a road trip from Oregon after a long dry spell up there, so if you are looking for water when nothing is running in Oregon, it's time to head to the Smiths!